I’m nearing the end of my Dream Home purchasing odyssey. In fact I have mustered the cash needed to buy the home, and wired it to my lawyer, in good time for completion. Hooray! What I haven’t quite found yet is the cash for the stamp duty, but I have another month to find that and think the market volatility could help. In any case you can see in my graph below that I have obtained over 100% of the purchase price – I am only a few % away from where I need to be including transaction fees etc. This means that right now I am the proud owner of over £1m of new debt. As I’ve recounted my progress in this journey, I’ve been extremely grateful for the comments and tweets I’ve had from readers. But polite and intelligent though they are, it is clear that some of them regard me as Stark Raving Mad. This has naturally had me wondering: am I Stark Raving Mad? So it’s time to share a stress test of my portfolio. Apologies if this post gets rather dry and technical. I haven’t found a more interesting way of considering my bonkers-ness. A portfolio stress test looks at how a portfolio would perform in a stressful environment. In this case, the stressful scenario is the Bear Market becoming really savage. We’ve already seen falls of over 20% from the peaks, and hence the journalists can roll out their “It’s official: we’re in a bear market” stories. But as Black Rock’s Larry Fink said, there isn’t yet much blood in the water – not many investors would have invested much at the market peaks, and really we are down under 10% from the levels which people have been putting serious money to work. At the time of writing FTSE-100 is at about 5900 and S&P-500 is at about 1900. How bad could it get from here? While past performance is no guide to future returns, blah de blah, the 2008/9 crisis is instructive. It was roughly as fierce as the previous 2000-2002 downturn and the 1987 one. Equities fell by over 50%. But balanced portfolios fared rather better, with Bonds providing a strong counterweight. 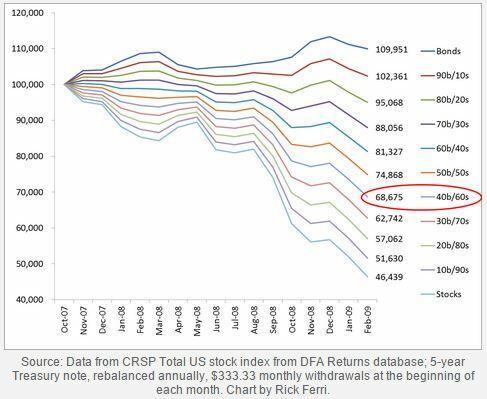 In fact a 60/40 portfolio fell by 32% (see Rick Ferri’s USA chart below; UK performance was similar) from peak. A 70/30 portfolio fell about 38%. Given that we are already 10-20% down, I regard the worst that can plausibly happen to a 66:33 portfolio as a further 30% drop from where we are today. Pause for a moment to consider what a 30% blended drop from today would feel like. If it mirrored 2008/9, equities would fall almost twice this much. So FTSE-100 would drop to 2700. S&P500 would drop to 850. I consider this to be a very implausible scenario; I think Ermine’s scenario of FTSE-100 dropping to 4400 far easier to imagine. But we are talking Stress Test so let’s stress it. The next question is what is the breaking point, at which point the portfolio fractures under stress? There is some ambiguity about this. But I consider the key requirement to be maintaining a total loan-to-portfolio-value fraction of no more than 50%. So that for every £1 of loan, I have at least £2 of portfolio. Ideally, I’d like to maintain this fraction for each currency I borrow in – i.e. for each $1 of loan I have at least $2 of portfolio too. This whole business is complicated by the fact that not all of my portfolio is in marginable accounts, but equally some of those marginable holdings will not fracture until the loan-to-value fraction reaches 75%. My astute readers will notice that relative to property mortgages, this is absurdly conservative, but that’s for another day. I’ve had to update my target allocations slightly in the light of the margin loans I’ve received. This new target allocation has 66:33 equity:bonds, a roughly equal UK:US equity bias, bonds being slightly UK weighted, and 25% being non-UK/US. At my target allocation, my net loan currently amounts to about 33% of my portfolio value; the UK loan comes to 43% of the UK portfolio. This gives me some wiggle room, but not too much. If my portfolio drops 30%, what happens? Without any changes, my portfolio fractures. Badly. My overall loan-to-value rises to 48%, which is close to breaking point. But the UK breaks – it reaches 61% loan-to-value. Disaster, right? Not so fast. In practice I have various remedies I can take. For instance if I convert some International and Australian holdings into UK holdings, I can mitigate the damage. In fact if I am prepared to accept the UK becoming 51% of my total portfolio, I can keep its loan-to-value to 52% – which is uncomfortable but not a fatal fracture. So in theory under my target allocation my risks look manageable. Unfortunately I’m not yet at my target allocation. And under my current allocation, my risks are higher. Right now my portfolio is slightly too large, funded by a slightly excessive loan, and within that I am overweight on equities and underweight bonds. And my loan is disproportionately in pounds, not dollars. My loan to value is 37%, not 33%. What this means is that under a 30% fall in the portfolio, my total loan to value would reach 53%, and my UK loan to value would reach 96%. Ouch! I’d have as much debt as my portfolio, leaving my UK holdings practically wiped out. As above, I can take steps to ameliorate this, by raiding my International/Oz holdings I can keep my overall LTV to 51% and my UK/US ones at 53-54%. This would be very hairy but is not out of the question. My conclusion from this is that my leveraged portfolio itself will, with care and attention, survive even a tough downturn. But obviously its value would drop precipitously – I’d lose 48% of my current value. Am I prepared to take this risk? Certifiably mad, surely? For me the answer involves my overall balance sheet. My investment portfolio is only part of my net worth. Once I complete on the Dream Home, I will be extremely long on UK property. In fact my properties will be worth over half of my net worth. They aren’t liquid, they (mostly) don’t provide income, and in fact they cost me money to own. But they are worth millions of pounds. And in fact if we enter Savage Bear Market territory, and it looks anything like 2008/9, then the pound will fall, and there is a reasonable chance that London property will hold steady or even rise (it being priced, more than people realise, in Euros). My properties could well amount to 75% of my net worth. Even in a highly stressed environment, my loan might amount to about 50% of my investment portfolio. But if the investment portfolio is shrinking to, say, 25% of my net worth, then the loan is under 15% of my net worth. I have two properties which would each more than pay off the loan. Even if the London property bubble bursts (it fell 16% in 2008, but rose 6% in 09) then I will still be able to get my overall LTV down under 25% in a doomsday scenario. To summarise, while my loan is nervewracking, and I can foresee my liquid portfolio shrinking to amounts I will find distressing, I consider that I have lots of ways to manage the risk. It doesn’t seem feasible that I could be forced into making an unwanted disposal. Famous last words? How about thinking of it another way. How many years would you need to delay FIRE for in the worst scenario? Will your skills be in demand for the period, and can you face doing the hours? Of course a simpler way of putting all this is that I have borrowed about 40% of the value of my property, on a more flexible basis than a mortgage, paying less than a mortgage. How risky is that? Your leverage is very small indeed, especially given your asset allocation (more than half property and a decent amount of bonds). But I wouldn’t agree that your loan is on more flexible terms than a mortgage. A mortgage is a long term contract, that you can keep as long as you make payments (even if you see massively underwater and reach LTV of well over 100%). A margin loan is not at all like that. You are essentially relying on your broker’s margin, which is a credit agreement subject to withdrawal on short notice. And I’m not even going into further complications if your broker goes bust for example etc. Perhaps you’ve mentioned it somewhere else and I haven’t seen, but why don’t you get an offset mortgage that you can have as a standby credit facility (so that you don’t incur costs as long as the margin loan is available and cheaper)? @GreekTaxPayer – a couple of people have asked why not get a mortgage. Two reasons: 1) I have a very cheap (tho small) mortgage against my old home which I would have to give up and 2) timing – I committed to buy the new home without a mortgage and 3) my income isn’t high, so the bank wanted security against my portfolio even for a mortgage. Once the dust has settled I will consider an offset mortgage to pay off the margin loan. It sounds like you have plenty of money. What is the point of all this tomfoolery exactly? Didn’t Uncle Warren say something about not needing leverage if you are clever enough and having no business going anywhere near if you aren’t? @polpo: Thanks for your comment. Why do I bother with leverage? Because I want to invest in productive assets, which my own house isn’t, and I can borrow money very cheaply to buy a house. If I was using a mortgage would you think it tomfoolery? I am asset rich but income poor so a mortgage is a bit tricky. Uncle Warren may yet be right hence I am seeking as much counsel and insight as possible! Luke Johnson is good on this topic, Other Peoples’ Money, in today’s Sunday Times, incidentally. If you were taking out a mortgage you didn’t need I would certainly think it tomfoolery; who wouldn’t? The essence of FIRE is accepting that one has enough even if that may be less than one really wants.From your blog it seems that you may well have enough, but the real purpose of your gearing up is to gain more (investing in productive assets is simply a longer hand way of saying it and besides, one doesn’t need gearing to do that). Searching for ‘more’ risks ‘enough’ and that rather defeats the object of the FIRE exercise. You might find the financial calamities of the Lloyds members of the 1990’s sobering reading. Looking for extra return by levering assets had a rather unhappy ending for them. Each to their own and good luck! I have just been clearing out some old files and have been reminded of a mortgage I took out 15 years ago. I didn’t need that mortgage. But I’m very glad I took it out – I did so because I because I believed in the power of leverage, and it has stood me in excellent stead. I found Rich Dad Poor Dad to be an excellent read back then and will post a blog about it at some point. I find the concept of ‘enough’ very hard to evaluate. I am a highly motivated individual, and find the concept of Retirement a bit tricky. I use capital productively (and philanthropically) and want more of it. That I risk ‘enough’ is indeed a cause of concern to me and hence I am putting a lot of thought / care into what I am doing. But your comment is good challenge and do please keep it coming.